Pathway analysis for results from genetic association studies could help us better understand complex traits. MEAGA (Minimum distance-based Enrichment Analysis for Genetic Association) performs functional/pathway enrichment test while integrating network information from biological interactome (e.g. protein-protein interaction network) using graphical algorithm techniques. MEAGA tests the hypothesis that genes from the susceptibility loci in the trait/disease-associated function/pathway are closer with each other in the biological interactome. MEAGA takes the markers used in the association results as input. Users would pre-specify the association signals and annotate the tagged genes for each marker (e.g. using linkage disequilibrium- or genomic distance- based block). For each functional gene-set being tested, MEAGA first identifies the overlapping genes from the signals, then utilizes graphical algorithms (Kou’s algorithm to identify Steiner Tree(s)) to construct subgraph(s) with minimum distance(s) in the interactome. MEAGA computes a statistic (S) summarizing the amount of overlapping genes and the overall shortest distance(s) of the subgraph(s). MEAGA uses sampling strategy to approximate the null distribution of S and compute empirical and multiple testing-corrected p-values. MEAGA was implemented in Python, and it requires the graphical features from NetworkX (Hagberg et al. 2008): https://networkx.github.io/ . 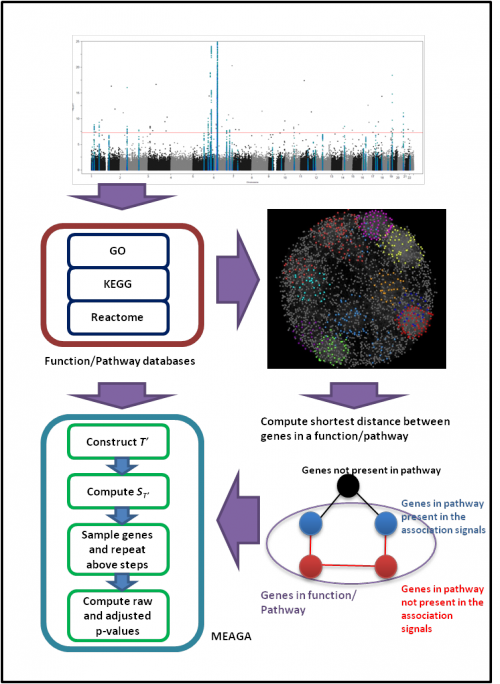 We obtained the functional and pathway annotation data from the GO (Ashburner et al. 2000), KEGG (Kanehisa et al. 2012), and Reactome (Croft et al. 2013) databases. We processed the GO’s gene-to-GO file so we also annotated each gene with the “ancestral” terms of its annotated term(s). A 5-column file for marker to gene annotation. The first four columns are the same as plink-map file, and the last column indicates the annotated genes (separated by semicolon). There are two final output files for MEAGA: MEAGAresult and MEAGAtree. The construction of Steiner trees is time consuming. The Kou’s algorithm requires the shortest distances and their paths to be first computed between genes. For effective performance, we pre-computed all shortest paths between genes in each function/pathway gene-set using data downloaded from different data sources and stored them in database to be readily retrieved when performing the Kou’s algorithm. 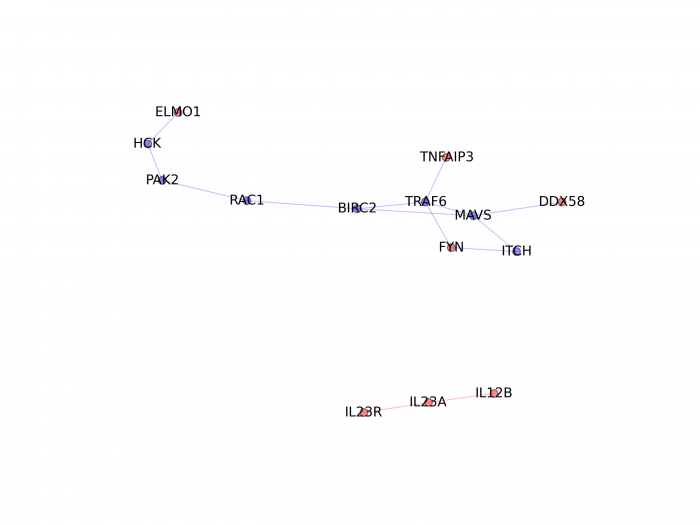 We provide users copies of the compiled databases of shortest paths for interaction data obtained BioGrid ( http://thebiogrid.org/ ), HPRD ( http://www.hprd.org/ ), and STRING ( http://string-db.org/ ). custom-interactome is a two-column file indicating the gene pairs with biological association. gene2fun.txt is a file annotating the gene to function/pathway relationships (see above). The (-m and -M) parameters specify the minimum and maximum number of genes in the functions/pathways to be considered, respectively. By default (-F) computation of shortest path between genes within a function/pathway would use all genes in the interactome, if user only uses genes within the pathway, (-f) could be specified. The result files of the above scripts are stored in ../test/ with prefix “test”. “interestedregionsgenes” is an one-column file with each row represents one unique locus, and the associated genes within the locus are separated by the semi-colon. “0” represents the difference between the number of function/pathway- overlapping genes and the number of function/pathway- overlapping loci we want. If you have any questions, please contact [ Alex Lam C Tsoi ]. This page was last edited on 4 March 2015, at 20:37.